Chester County Commissioners Kathy Cozzone and Ryan Costello meet with students from local schools about the Food Check Out program. WEST CHESTER — Students in six schools, including Patton and Kennett Middle Schools, learned how to stretch food dollars to purchase nutritious food while also working to alleviate hunger in their communities during the Farm Bureau’s annual Food Check-Out Week. Susan Rzucidlo developed and organized the program for the second year, which involves connecting student groups from local schools with food cupboards and agriculture. Each student group was given $100 to spend at their local supermarket to purchase nutritious food listed as being most needed by the Chester County Food Bank. Students had to compare prices, special offers and use coupons. The total dollars saved by careful selection of brands and items allowed students to purchase up to $160 worth of food for the $100 they had to spend, a valuable lesson indeed in these economic times. The food and money donations were delivered by the students to the Food Cupboard nearest to them. Many students were not aware of these Food Cupboards or of the great need in Chester County. Delivering food to their local Food Cupboards offered a new experience for many of students. They learned that “even if you are 12 you can make a difference to someone.” Schools also held food drives during this week. 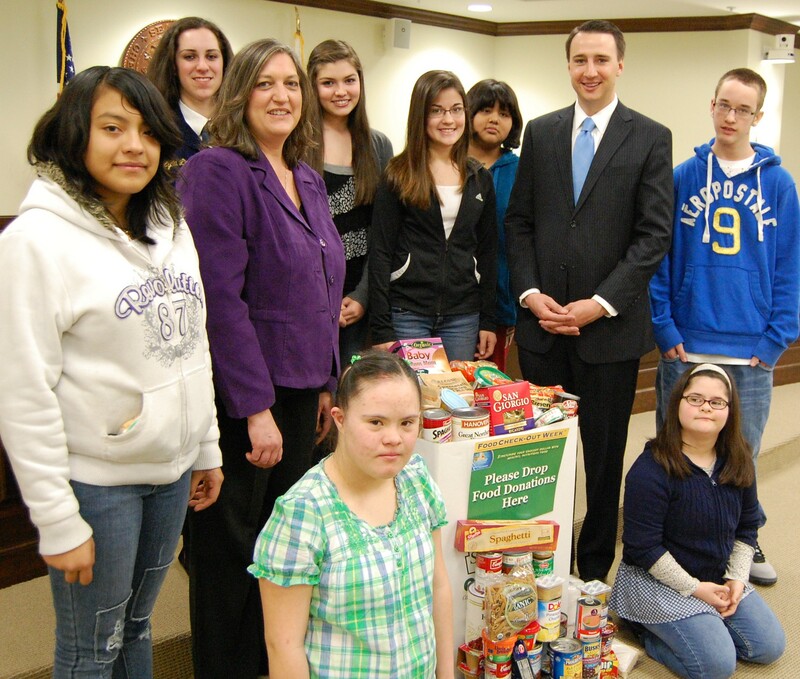 At the ceremony in the Commissioners’ Office in West Chester on Wednesday February 29 to honor the students who participated, Commissioners Kathi Cozzone and Ryan Costello reinforced the message “Stretch your dollars, eat healthy” and “help families who can’t afford to meet their food needs”. They reminded us that one in eight people go hungry during some part of the month in Chester County, one of the wealthiest counties in Pennsylvania and 24th wealthiest in the nation. We were also reminded that agriculture is the number one industry in Chester County, second of all counties in farm sales revenue in our state. Susan Larson, Kennett High School teacher, really liked the program as it “provided a real life experience outside the classroom” for students who would soon be making food purchase decisions when they left school. Penn’s Grove Middle School, Oxford students were also enthusiastic about Food Check-Out Week. The program enabled them to consider not only food costs but also healthy eating choices in selecting and purchasing the food they delivered to Neighborhood Services. The Future Farmers of America (FFA) group at Octoraro High School designed a poster and has been collecting funds so that they can purchase strawberries to give to every kindergarten student in late March together with nutritional information. Students from the Charles F. Patton Middle saved $64.06 by shopping smart and taking advantage of the deals. The Kennett Food Cupboard receives approximately 150lbs or canned and boxed foods. Charles Graydus, Chester Delaware County Farm Bureau Board member and Octorara High School FFA advisor, explained that the mission of the Farm Bureau is not only to advocate for farmers but also support the local community and provide food to the hungry and education on food and farming to youth and consumers. The schools participating were Kennett Middle and High School, Oxford’s Penn’s Grove Middle School, Charles F. Patton Middle School, After-The-Bell program, Kennett Middle School and the Future Farmers of America, Octorara High School. The Farm Bureau and the students invite everyone to locate a food cupboard near them and take food or a donation to continue to help our neighbors in need. Peanut butter, tuna, beans, cereals and rice are in great demand right now. The Chester-Delaware County Farm Bureau is a voluntary organization that works to advance the interests of agriculture and rural communities by working with policy makers at state and federal levels. It offers numerous benefits and services to its over 6,000 members, and is affiliated with the Pennsylvania Farm Bureau and the American Farm Bureau Federation.